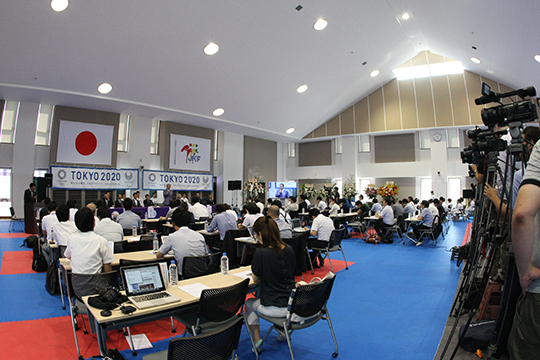 A press conference starting at 10 o’clock on August 4th was held at Nihon-Karatedokaikan following the announcement about the official decision to add karate as a part of the Tokyo 2020 Olympic Games. Approximately 80 members of the press arrived looking for news coverage, which is the highest number on record. Officials from the Japan Karatedo Federation including President Sasagawa Takashi, along with 4 contestants who won last year’s All-Japan Championship including Araga Ryutaro, Uekusa Ayumi, Kiyuna Ryo, and Shimizu Kiyou, attended the conference. We also had Chief Mifuji Yoshio of the Director’s Bureau of the Nippon Budokan with us. “First, I would like to express my gratitude to you all. The dual pleasure of having the Emperor’s Cup and the Empress’s Cup bestowed upon us at the All-Japan Championship this May, and getting included in the Olympic Games today, leaves me speechless with joy. At the same time, I also feel a great sense of responsibility. 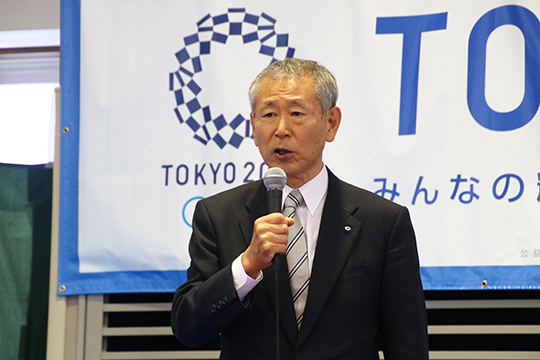 We would like to put in more resources than ever from now on to train and strengthen our athletes at all costs to win medals at the 2020 Olympic Games,” stated President Sasagawa. Afterwards, a live connection was made with the IOC general meeting in Rio de Janeiro to receive words of joy from World Karate Federation President Antonio Espinós. “This is a historic day for karate”, said Espinós, expressing thanks, “I would like to express my utmost thanks to President Sasagawa and all of the athletes who worked so hard to have karate accepted into the Olympics”. 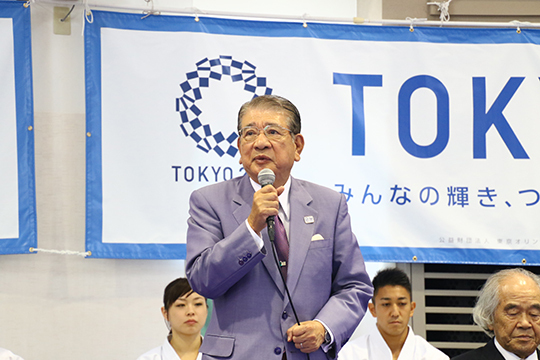 Director Mifuji of the Nihon Budokan, the host venue karate at the Tokyo Olympics, expressed joy at the addition of karate as an official event. “We will prepare fully to ensure that karate is a success at the Tokyo 2020 Olympic Games”, he strongly proclaimed. It was a lively event, and after the press conference, group and individual interviews of athletes and officials continued on for a long time, greatly exceeding the planned length of the event. The event really made one feel the degree to which there is focus on karate.